Uses only 4% of the Energy of a standard 300 watt incandescent Dock Light! 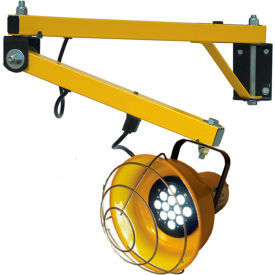 This highly-efficient LED dock light is the perfect way to reduce operating costs. Each light has 12 white light LED emitters offering 960 maximum lumens output with only 12 watts of energy consumption. LED bulbs have a rated life of 50,000 hours. Custom beam angle of 15 degrees illuminates a trailer from 121 foot candles @ 10' to 3.2 foot candles @ 53'. Unit features a 5'L 18/3 SJTW conductor power cord with NEMA 5-15 grounded plug, and an 18"L cord plugs directly into the junction box on the arm. Arm is constructed of 1-½" square, 14 gauge steel tubing with a safety yellow enamel finish for years of service. On/Off switch and wire bulb guard are included with on light head. 3" x 5" mounting plate easily attaches with four 3/8" bolts. Shipped assembled.